The city of Pavlopetri (Greek: Παυλοπέτρι), underwater off the coast of southern Laconia in Peloponnese, Greece, is about 5,000 years old, making it one of the oldest submerged lost cities, as well as the oldest in the Mediterranean sea. The name Pavlopetri ("Paul's and Peter's", or "Paul's stone") is the modern name for the islet and beach, apparently named for the two Christian saints who are celebrated together; the ancient name or names are unknown. 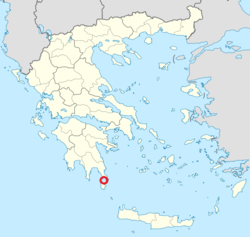 Discovered in 1967 by Nicholas Flemming and mapped in 1968 by a team of archaeologists from Cambridge, Pavlopetri is located between the Pavlopetri islet across the Elafonisos village and the Pounta coast. The coast, the archeological site as well as the islet and the surrounding sea area are within the region of the Elafonisos Municipality, the old “Onou Gnathos” peninsula (according to Pausanias). It is unique in having an almost complete town plan, including streets, buildings, and tombs. Originally, the ruins were dated to the Mycenaean period, 1600–1100 BC but later studies showed an older occupation date starting no later than 2800 BC, so it also includes early Bronze Age middle Minoan and transitional material. It is now believed that the town was submerged around 1000 BC by the first of three earthquakes that the area suffered. The area never re-emerged, so it was neither built-over nor disrupted by agriculture. Although eroded over the centuries, the town layout is as it was thousands of years ago. The site is under threat of damage by boats dragging anchors, as well as by tourists and souvenir hunters. The fieldwork of 2009 was largely to map the site. It is the first submerged town digitally surveyed in three dimensions. Sonar mapping techniques developed by military and oil prospecting organizations have aided recent work. The city has at least 15 buildings submerged in 3 to 4 metres (9.8–13.1 ft) of water. The newest discoveries in 2009 alone cover 9,000 m2 (2.2 acres). Four more fieldwork sessions were planned in October 2009, in collaboration with the Greek government as a joint project aimed at excavations. Also working alongside the archaeologists (from the University of Nottingham) are a team from the Australian Centre for Field Robotics, who aim to take underwater archaeology into the 21st century. Several unique robots have been developed to survey the site in various ways. One of the results of the survey was to establish that the town was the centre of a thriving textile industry (from the many loom weights found in the site). Also many large pitharis pots (pottery jars) from Crete were excavated, indicating a major trading port. The work of the British-Australian archaeological team was assembled in an hour-long BBC documentary video, "City Beneath the Waves: Pavlopetri", broadcast by BBC Two in 2011. The city of Pavlopetri is part of the underwater cultural heritage as defined by the UNESCO in the UNESCO Convention on the Protection of the Underwater Cultural Heritage. All traces of human existence underwater which are one hundred years old or more are protected by the UNESCO Convention on the Protection of the Underwater Cultural Heritage. This convention aims at preventing the destruction or loss of historic and cultural information and looting. It helps states' parties to protect their underwater cultural heritage with an international legal framework. ^ "Dwarka. Mythical City Found Under Water?". unacknowledged.info. Retrieved 2015-11-25. ^ "World's oldest submerged town dates back 5,000 years". Paleontology & Archaeology. e! Science News. 2009-10-16. Retrieved 2009-10-24. ^ Helena Smith (2009-10-16). "Lost Greek city that may have inspired Atlantis myth gives up secrets". The Guardian. ^ Henderson, Jon (2009-05-14). "Race to Save World's Oldest Underwater Town". Green Room Blog. WetSand.com. AlphaGalileo. Retrieved 2009-10-24. ^ Henderson, Jon (2009-05-12). "Race to preserve the world's oldest submerged town". AlphaGalileo. Retrieved 2009-10-24. ^ a b Henderson, Jon (2009-05-12). "Race to preserve the world's oldest submerged town". University of Nottingham. Archived from the original on 2011-11-23. Retrieved 2009-10-24. ^ BBC News "Sea gives up secrets to experts", 16 October 2009; accessed 16 October 2009. ^ Henderson, Jon (2009-10-16). "World's oldest submerged town dates back 5,000 years". University of Nottingham. Retrieved 2009-10-24. ^ "Jon Henderson - The University of Nottingham". Nottingham.ac.uk. 1998-09-27. Retrieved 2012-02-22. ^ "City Beneath the Waves: Pavlopetri". BBC. Retrieved 22 February 2012. ^ "City Beneath the Waves: Pavlopetri"
This page was last edited on 2 March 2019, at 14:26 (UTC).